For other uses, see Saint Monica (film) and Santa Monica (disambiguation). Saint Monica (c.331/2−387) (AD 322–387), also known as Monica of Hippo, was an early Christian saint and the mother of St. Augustine of Hippo. She is remembered and honored in most Christian denominations, albeit on different feast days, for her outstanding Christian virtues, particularly the suffering caused by her husband's adultery, and her prayerful life dedicated to the reformation of her son, who wrote extensively of her pious acts and life with her in his Confessions. 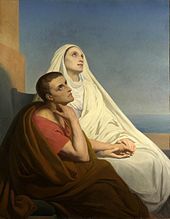 Popular Christian legends recall Saint Monica weeping every night for her son Augustine. Because of her name and place of birth, Monica is assumed to have been born in Thagaste (present-day Souk Ahras, Algeria). She is believed to have been a Berber on the basis of her name. She was married early in life to Patricius, a Roman pagan, who held an official position in Thagaste. Patricius had a violent temper and appears to have been of dissolute habits; apparently his mother was the same way. Monica's alms, deeds and prayer habits annoyed Patricius, but it is said that he always held her in respect. Monica had three children who survived infancy: sons Augustine and Navigius and daughter Perpetua. Unable to secure baptism for them, she grieved heavily when Augustine fell ill. In her distress she asked Patricius to allow Augustine to be baptized; he agreed, then withdrew this consent when the boy recovered. But Monica's joy and relief at Augustine's recovery turned to anxiety as he misspent his renewed life being wayward and, as he himself tells us, lazy. He was finally sent to school at Madauros. He was 17 and studying rhetoric in Carthage when Patricius died. Augustine had become a Manichaean at Carthage; when upon his return home he shared his views regarding Manichaeism, Monica drove him away from her table. However, she is said to have experienced a vision that convinced her to reconcile with him. At this time she visited a certain (unnamed) holy bishop who consoled her with the now famous words, "the child of those tears shall never perish." Monica followed her wayward son to Rome, where he had gone secretly; when she arrived he had already gone to Milan, but she followed him. Here she found Ambrose and through him she ultimately had the joy of seeing Augustine convert to Christianity after 17 years of resistance. In place of a basket filled with fruits of the earth, she had learned to bring to the oratories of the martyrs a heart full of purer petitions, and to give all that she could to the poor—so that the communion of the Lord's body might be rightly celebrated in those places where, after the example of his passion, the martyrs had been sacrificed and crowned. Mother and son spent six months of true peace at Rus Cassiciacum (present-day Cassago Brianza) after which Augustine was baptized in the church of St. John the Baptist at Milan. Africa claimed them, however, and they set out on their journey, stopping at Civitavecchia and at Ostia. Here death overtook Monica, and Augustine's grief inspired the finest pages of his Confessions. Saint Monica was buried at Ostia, and at first seems to have been almost forgotten, though her body was removed during the 6th century to a hidden crypt in the church of Santa Aurea in Ostia. 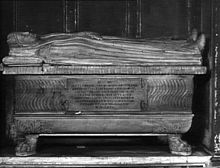 Monica was buried near the tomb of St. Aurea of Ostia. It was later transferred to the Basilica of Sant'Agostino, Rome. Anicius Auchenius Bassus wrote Monica's funerary epitaph, which survived in ancient manuscripts. The actual stone on which it was written was rediscovered in the summer of 1945 in the church of Santa Aurea. The fragment was discovered after two boys were digging a hole to plant a football post in the courtyard beside Santa Aurea. Here the most virtuous mother of a young man set her ashes, a second light to your merits, Augustine. As a priest, serving the heavenly laws of peace, you taught [or, you teach] the people entrusted to you with your character. A glory greater than the praise of your accomplishments crowns you both – Mother of the Virtues, more fortunate because of her offspring. About the 13th century, however, the cult of St. Monica began to spread and a feast in her honour was kept on 4 May. In 1430 Pope Martin V ordered the relics to be brought to Rome. Many miracles are said to have occurred on the way, and the cultus of St. Monica was definitely established. Later the archbishop of Rouen, Guillaume d'Estouteville, built a church at Rome in honour of St. Augustine, the Basilica di Sant'Agostino, and deposited the relics of St. Monica in a chapel to the left of the high altar. The Office of St. Monica, however, does not seem to have found a place in the Roman Breviary before the 19th century. The city of Santa Monica, California, is named after Monica. A legend states that in the 18th century Father Juan Crespí named a local dripping spring Las Lagrimas de Santa Monica ("Saint Monica’s Tears") (today known as the Serra Springs) that was reminiscent of the tears that Saint Monica shed over her son's early impiety. As recorded in his diary, however, Crespí actually named the place San Gregorio. What is known for certain is that by the 1820s, the name Santa Monica was in use and its first official mention occurred in 1827 in the form of a grazing permit. There is a statue of this saint in Santa Monica's Palisades Park by sculptor Eugene Morahan; it was completed in 1934. The "weeping" springs outside Santa Monica, California were named for the saint. Patricia McGerr fictionalized her life in the 1964 novel, My Brothers, Remember Monica: A Novel of the Mother of Augustine. In the 2012 film Restless Heart: The Confessions of Saint Augustine, Saint Monica is portrayed by Italian actress Monica Guerritore. In the oratorio La conversione di Sant'Agostino (1750) composed by Johann Adolph Hasse (libretto by Duchess Maria Antonia of Bavaria), Saint Monica's role in the conversion of her son Saint Augustine is dramatized. ^ The Liturgy of the Hours, Volume IV. Proper of Saints, August 27. ^ Michael Brett and Elizabeth Fentress, The Berbers, Wiley-Blackwell, 1997, p.71. ^ Power, Kim (1999) "Family, Relatives", pp. 353–54 in Augustine through the ages: an encyclopedia. Allan D. Fitzgerald (ed.). Grand Rapids: Wm. B. Eerdmans, ISBN 978-0-8028-3843-8. ^ a b c "Church of Sant'Aurea". Ostia-Antica.org. Retrieved March 15, 2011. ^ Peter Brown, Augustine of Hippo: A Biography, Revised Edition with a New Epilogue (University of California Press, 2000), 124. ^ a b c Paula A. Scott, Santa Monica: a history on the edge. Making of America series (Arcadia Publishing, 2004), 17−18. ^ "Santa Monica Sculpture". You Are Here.com. n.d. Retrieved March 14, 2011. ^ Patricia McGerr (1964), My Brothers, Remember Monica: A Novel of the Mother of Augustine, New York: P. J. Kenedy. ^ Smither, Howard E. (1977-01-01). VIC&pg=PA98&lpg=PA98&dq=la+conversione+di+sant'agostino+oratorio+hasse&source=bl&ots=z_eeg---Ko&sig=IuP4YyqweCpi80_m_udCs1m6Fs8&hl=en&sa=X#v=onepage&q=la%2520conversione%2520di%2520sant'agostino%2520oratorio%2520hasse&f=false A History of the Oratorio Check |url= value (help). UNC Press Books. ISBN 978-0-8078-1274-7. Wikimedia Commons has media related to Saint Monica of Hippo. Herbermann, Charles, ed. (1913). "St. Monica" . Catholic Encyclopedia. New York: Robert Appleton Company.